Crews frantically sifted through a garbage truck to rescue a man trapped inside. NBC10's Matt DeLucia has more on the confusion over how the man wound up inside a trash truck inside of a secured halfway house property. 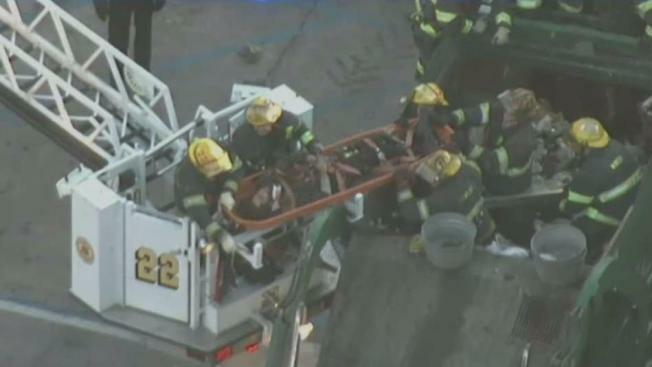 Firefighters dug through trash and debris in the back of a garbage truck as they worked for hours to free a man stuck outside a Philadelphia halfway house. The dramatic rescue played out inside a Waste Management Truck outside the The Kintock Group home along the 300 block of East Erie Avenue around 5:30 a.m. Monday, according to the facility and fire dispatchers. Firefighters located the 33-year-old man in the compacter section of the truck and worked to get to him by removing trash for more than two hours. Firefighters got the man onto a stretcher and out of the truck around 7:40 a.m.
You could see the man moving his arms while strapped to a stretcher. He was listed in critical condition with abdomen, hip and leg injuries, Philadelphia Police said. Kintock serves as a rehab center, the final stop, for incarcerated people before they reenter the general community. Authorities initially said the man had escaped from the facility but a roll call revealed no escapees, Pennsylvania Department of Corrections spokeswoman Susan McNaughton said. It was unclear how the man got into the secured facility grounds. He could have been asleep in the dumpster or wound up in the truck before it drove onto the grounds.